Jonathon David Bogg, 24, of 28 Markenfield Road, Harrogate, was fined £300 for breaching a restraining order by sending text messages. He was ordered to pay a victim surcharge of £30 and a criminal courts charge of £180. Tracey Welbourn, 47, of 5 Alma Flats, Low St Agnesgate, Ripon, was given a 12-month conditional discharge for assault by beating. She was ordered to pay a £15 victim surcharge, £85 costs and a criminal courts charge of £150. She was given a further 12-month conditional discharge for a second count of assault by beating. 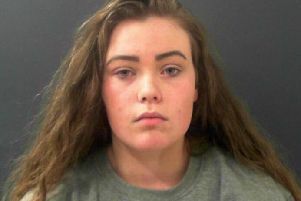 Georgia Kathryn Hebden, 18, of 11 Bond End, Knaresborough, was given a 12-month conditional discharge for assault by beating. She was ordered to pay compensation of £50, a victim surcharge of £15, costs of £85 and a criminal courts charge of £520. A further 12-month conditional discharge was given for a second count of assault by beating. Matthew David Waddington, 34, of 39 King Edward Road, Ripon, was sentenced to 16 weeks’ imprisonment for assault by beating at Booths supermarket car park in Ripon. He was ordered to pay compensation of £50. Two concurrent sentences of four weeks each were imposed for stealing food worth £11.22 from Booths and worth £3 from Morrisons in Marshall Way, Ripon. A consecutive two-week sentence was given for failing to surrender to custody at Harrogate Police Station. No separate penalty was imposed for committing further offences while subject to a previous conditional discharge. For a separate charge of assault by beating, Waddington was given a concurrent 20-week prison sentence and ordered to pay compensation of £50 and a criminal courts charge of £150. Magistrates imposed a five-year restraining order to prevent him from contacting the victim. Andrew Stuart McDonald, 23, of 12 Greengate Lane, Knaresborough, was fined £80 for damaging a wall at 19 Queens Road, Knaresborough. He was ordered to pay a victim surcharge of £20, costs of £85 and a criminal courts charge of £150. Averescu Muntean, 20, of 60 Bethel Road, Rotherham, was fined £660 for obstructing a police officer in York Road, Knaresborough. He was ordered to pay a victim surcharge of £66, costs of £160 and a criminal courts charge of £520. No separate penalty was imposed for driving without a licence and without insurance, but he was disqualified from driving for six months.